Maria Carter makes the most elegant and feminine gemstone jewelry with a sophisticated palette of colors and textures. Each of her signature pieces are intricately wire wrapped to showcase the beauty of the gorgeous colorful gemstones. One of my favorites from the Holiday collection are these spectactular earrings featuring apatite, hessonite garnet and carnelian. 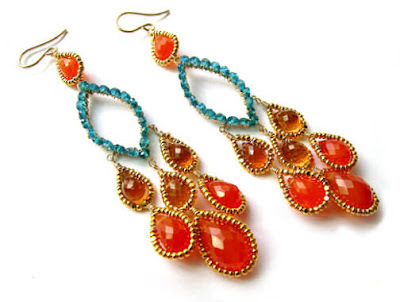 Very detailed, the aqua apatite rondelles are wire wrapped to a handforged 14K gold marquis with the carnelian and hessonite briolettes individually wrapped with tiny 24K gold charlotte beads. What a fantastic pop of color for your ears! Check out more of her colorful and edgy designs HERE.